Damaged bank notes may leave you “short-changed” Source: Supplied. It’s a little known fact that damaged and incomplete banknotes may not be worth their full face value. Brisbane man Tony Morrison found this out the hard way after he received a damaged twenty-dollar note from a fast-food restaurant. It wasn’t until Mr Morrison tried to use the note at another store that he realised that it wasn’t worth the full face value of the note. “The cashier wouldn’t accept it because it wasn’t the full note,” Mr Morrison said. 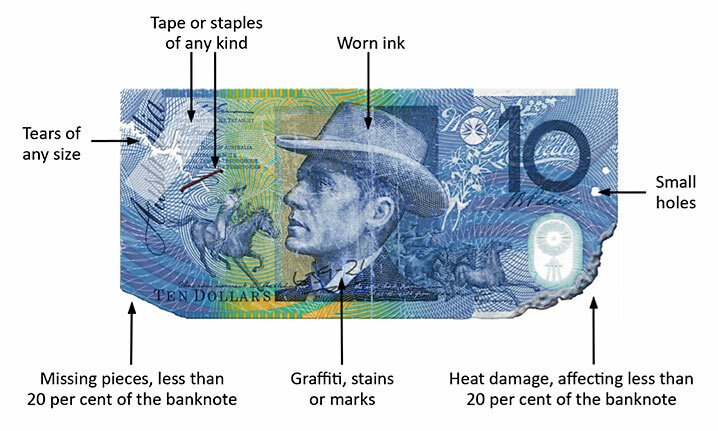 According to the Reserve Bank of Australia’s website, it less than 20 percent of the banknote is missing the note is worth its full value, however a banknote with a significant amount missing is classified as “incomplete”, and is worth less money. This means that half of a ten dollar banknote is only worth five dollars, and the three-quarter’s of Mr Morrison’s twenty dollar banknote was only worth fifteen. The Reserve Bank of Australia says that this policy is necessary as it takes into account that the missing pieces of the banknote may eventually be presented for value separately. So next time you make a purchase with cash, make sure to check not only that you’ve been given the correct amount of change, but that you have been given complete and undamaged notes as well!